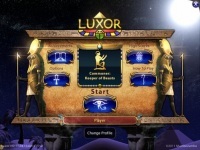 Luxor is an action-puzzle game of matching 3. It is similar to games like zuma and marble lines, which challenge the player to remove all spheres on the screen before they reach the pyramid. Use the mouse to move the shooter. Left-click to shoot and right-click to switch color. Create matches of three or more to eliminate orbs and prevent them from coming into the pyramid. Make more than 3 matches to grab falling powerups and use them to help finish the level more quickly.